I have been entranced by some beautiful (local!) homes and gardens and getaways, and I'd like to share some of my favorites. I haven't been to any of these, but I'd love to! Aren't these little cabins just amazing? They are affiliated with Sun Mountain Lodge. I've always wanted to plan an overnight trip after I had lunch with my mom there a few years back. The views are stunning! I'd love to be there even in the snowy season. Doesn't this historical lodge just thrill you? It does me! And what about this cozy little beach cabin...feet from the water? Where do you go to 'get away'? Do you travel in state? We have so much to see in Washington! What has your favorite getaway been? I was able to do a 'mini getaway' this past weekend with friends. It was heavenly, and close! Hopefully I'll share some pictures soon. Another one of my passions: children's books! And boy, do I get a chance to indulge in that with my two daughters. They are both fully in love with books, and I could not be happier. It is a challenge to keep up with their "mommy I need more books" requests---we go to the library once a week, and that is barely enough. I also love to have great books that they can own to read and re-read. I was so thrilled to have Nancy Traversy from Barefoot Books hand me a book at the Mom 2.0 Summit recently. "Take it home to your kids," she urged me over the book table where I was fawning over everything. I was thrilled. Did I say that before? Thrilled. 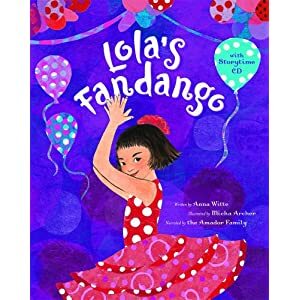 The book was a colorful hardcover called "Lola's Fandango". I love music, and the title snagged MY interest right away, not to mention the beautiful illustration on the cover. When I got home, it was one of the first gifts into the girls' hands out of my suitcase, and the CD that we discovered inside the back cover was popped into the player the next morning at breakfast. The narration and music is lovely, and the illustrations are magical. The text is displayed rather inventively on each page, and adds a fun twist to the experience. You can see more about this book and others here, and even watch this cute little video about the making of the narration CD. Thank you Nancy! I can't wait to see what other adventures Barefoot Books has in store for my family. Please check out their wonderful site. It has so many wonderful books! ****Full Disclosure: I did receive the book Lola's Fandango as a gift (thanks again, Nancy! ), but the opinions above are certainly my own. Oh my. What a morning. It's just such a great story that I MUST share it or I will burst. I have been anticipating the launch of my friend Gabrielle Blair's new video series. Yes, I said friend. We're tight. Okay, I met her at the Mom 2.0 conference, and we are likely only categorized as acquaintances, but in my little mental happy world we are friends, okay? No really. Olive Us Episode 1: Garden Day from Olive Us on Vimeo. Olive Us Aims with Ben Blair from Olive Us on Vimeo. Now imagine, for one moment, that while my children are watching said video above that I walk 12 steps into the kitchen to grab my six-year-old's lunch to put in her backpack. The current sound track was Ben Blair saying something about "teaching our kids to be kind and loving brothers and sisters"...and I was thinking, Yes, I've done that. Good job, me. Honestly, I was having one of those warm and fuzzy moments in my heart, where I was reveling in the kind and loving sister-moment that I had just seen seconds before as they huddled next to the screen watching the Blair kids happily plant in their garden...interjecting a few sweet comments like 'That's Baby June!' (that's from my two year old who is happily aware that June and she are the same age) and 'We planted tomatoes in our garden too!' and 'Look at them pull weeds like we do!'. And after that ten seconds of fantasy land, as I was walking back with lunchbox in hand, I hear a BLOOD CURDLING SCREAM. I don't know. Apparently my children will benefit from the Olive Us video series just as much as the hooligans down the block. Is it normal for two year olds to switch from biting-my-sister-face-to-innocent-little-pout in less than two seconds flat? Make me feel better, please? Have your children ever done something totally out of the blue? When you thought you were doing a bang-up job? Tell me about it. P.S. You can subscribe to the Olive Us series here. I can't wait to see the next episode! I'm going to buy a muzzle for the viewing. Or maybe a popsicle would work. P.P.S. Well done, Gabby! Well done. I spend a lot of time thinking about color, mostly because I love it, and because it's FUN. Most can visualize the color wheel. Traditionally it looks something like this. When I begin talking like this, generally my clients either get panicked, or they go a bit glassy eyed. Listen, here is a reason that you should pay attention. Are you listening? It will save you money. The more you understand about yourself in relation to color theory, you will save hundreds of dollars avoiding trends, and cherry-picking only what truly appeals to you. Actually, this applies to fashion as well as interiors...and that's another, different post. The basic theory is simple, really simple----if you contrast the colors that you really love (say, RED) with a neutral that nods to its complimentary cousin (GREEN), you have a scheme that adds a sophisticated twist to it, and something that I call 'color tension'. Now, don't get all upset, I can hear the comments now. You've just described a Christmas color scheme. How original. Precisely. You won't forget this analogy while standing in Pier 1 because of that brilliant stroke. This lesson can be easily translated across the color wheel into any family of shades. Take a look. This next photo is more of an "analogous" scheme (fancy way of saying 'related colors'). The use of gold and a slightly greener shade is very calming. Do you see the complimentary relationship in that tile scheme? Smoky blue pebble tile pops with the rust colored grout. Javier Senosian does some incredibly cool spaces. You can see more of his work here. Now, to leave you with one more piece of eye candy. Isn't THIS color wheel fabulous? Doesn't that just make you smile? I'll never look at a little drink umbrella the same again. If you enjoy this, you may like this as well. Oooo! And check this out. Where does one get that much yarn???? If you've enjoyed this post, please comment below. I'd love to hear how you use the color wheel (or don't!) in your purchasing. Do you like what you are finding in retail stores now? Do you buy the 'seasonal' things in Target? I'm dying to know. I'm a Designer/Mom/Opinionated Woman with a lot to say.